As treats are a focus today and even on All Saint's Day as many families combine dressing up, candy and All Saints Day Celebrations, I thought I would just offer a few themed things on sweets and treats. This delightful card set tells a baker's story of the things and ingredients needed in their kitchen to bake sweets and treats. Numerals, number words and graphics all match to teach numbers from one to twenty. This set includes twenty bright and colourful cards that also reinforce basic reading skills of simple sentences and words associated with a kitchen including measuring cups, mixers, rolling pins and more. See our collection of math learning cards to download our fun and interactive Welcome to My Kitchen Learning Card Set. 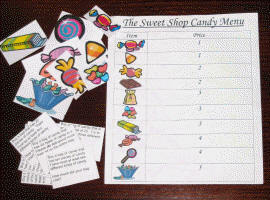 Our Sweet Shop Candy Math Game is perfect for today as it features collecting candy while teaching valuable math skills. Featured before on our blog, it is worth a repeat mention as the kiddos love playing this game. Adjectives are words that describe a noun. Help children learn to increase their descriptive skills with our unique worksheets that allow not only for writing but drawing as well. Why include drawing? Writing limits many young learners who haven't quite developed the dexterity or spelling skills needed to keep up with their thoughts. Writing isn't always necessary to show proof of understanding. I'm sure Socrates and Charlotte Mason would agree with this statement whole heartedly. This little set of three worksheets features a pumpkin, a princess and a cute little ghost. Download our Halloween Set of Adjective Write and Draw Worksheets. Hope this helps bring a few smiles to your kiddos faces.